After spending a wonderful Thanksgiving with Mom and Kepi, it was time to put up the tree and light up the house with the Christmas spirit. This tree is so beautiful to look at especially when it's all lit up at night. Every year, we buy an ornament that represents what our year was like. This year, we added a faberge egg ornament we got in St. Petersburg, Russia. I already feel Christmas in my heart. 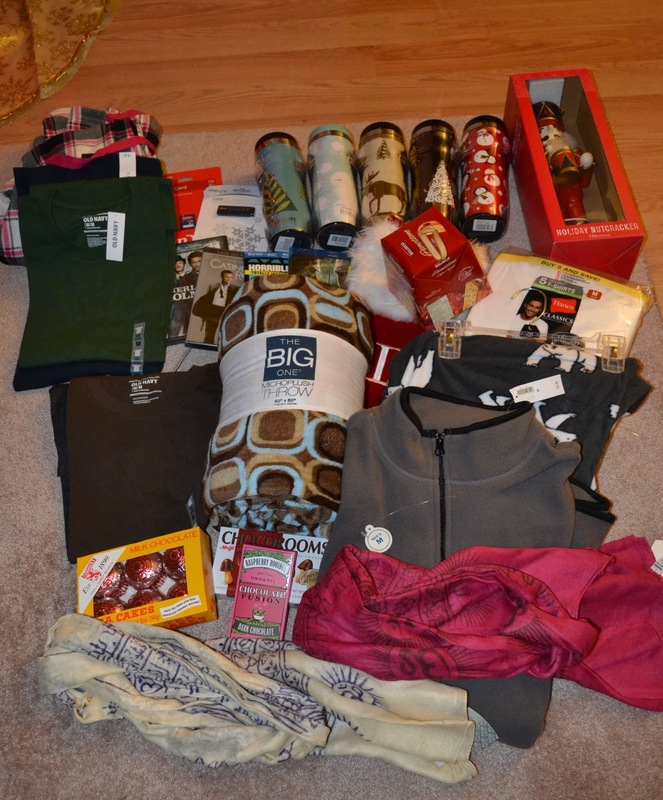 Of course, we hit the stores on Black Friday and here's our loot. I think we did well on the shopping this year especially that we got DVD and Blu Ray movies as cheap as $1.99 to $3.99. Majority of our purchases were 50% off. We also got free Tin Tin ornaments and movie tickets this year. The lines weren't bad, and I think that's because some stores were open at 9 pm and 12 am Thanksgiving Day. Just wondering, anyone want to do an exchange gift with me? Nothing fancy or expensive but just something to look forward to on the mail. Let me know. Putting up the tree gives me such a wonderful feeling. My husband and I used to do the ornament thing too. We'd get a special one each year but we seem to have forgotten to do it these past couple of years. your christmas tree is indeed beautiful. i love it. christmas na christmas na talaga ang feeling. at ang dami mong loots ha. at parang gusto ko yong chocolates ha. hehehe. I'd love to do that. Count me in. I hope there's more of us. Someday maybe just for adventure's sake, I'd try Black Friday shopping. takot ako eh. My tree is up too. So glad. That is a lovely tree adorned with ornaments that have special meaning in your lives, that's a nice touch! wonderful christmas tree you got there! admittedly, i only learned a few weeks back that unlike what we do in pinas where christmas decors and holiday songs come as early as september, setting up the tree in us comes after thanksgiving. toinks! here in penang, we also raised a tree, and my wife and i let our son do the decoration. @ Loree, Buying ornaments is something I like to do because whenever I hang them on the tree, I remember great travel memories. @ Eds, Thank you. I love this tree too, and I've been using it for three years. @ Photo Cache, We worked on the tree on Saturday. It's always fun to put it up every year. It seems that there's three of us. It will be a small exchange gift but something that makes my mailbox smile. @ Josiet, You said it :) Your tree is beautiful too. @ Sheng, Sayang, don't really have an address there na. @ Daphne, Oh no worries, there's always next year. @ Docgelo, Thank you. I bet your Chrismtas tree is lovely. @ Kate, Ok, I'll post mechanics even if there's only three of us. hi Kayni! oh, how i love your Christmas tree. 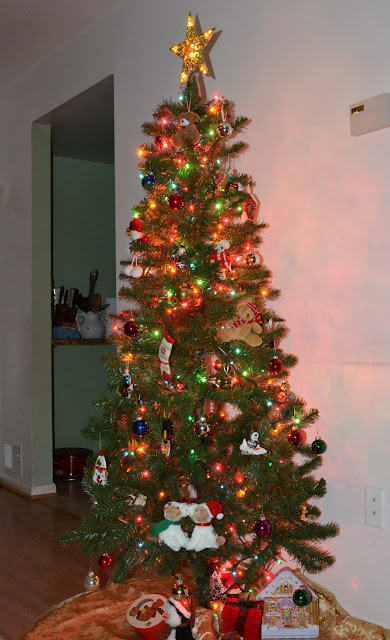 growing up, we never really had a big Christmas tree as we only have a small house. 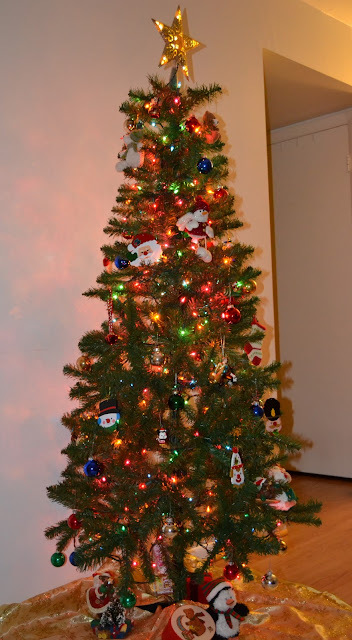 Mama would only put up about 3 feet tall tree and when the family got bigger, she decided there wasn't need for a not so big tree anyway and bought a small one we could just put on a top shelf. Alex promised me a big tree this year but since we're spending big on SooAe's photo shoot, i also decided to just buy ornaments i could possible tape against our walls, haha. it would be nice to have an exchange gift with you, maybe getting one of those cute coffee thermal/insulated mugs, kkk. however, with the cold weather now, always preventing me and sooae to go out is quite frustrating.. haha. @ Jehan, We grew up without a tree as well, and we only had a wall decorated with a photo of Santa. No worries about the exchange gift, I just tried to ask if someone wants to do it with me. My mailbox and I need some cheering kasi :). You stay warm.